Made a start on my new painting today. This painting has offered me a great opportunity to compare one area of it, halfway through completion and then with the final result. I usually aim to finish a section in one sitting so it’s unusual for me to step back and look at what’s happening halfway through. As you can see, in the first photo I have laid down unblended colours which indicate the final values and describe the darkest and lightest parts of the subject. I have begun to give the subject form. 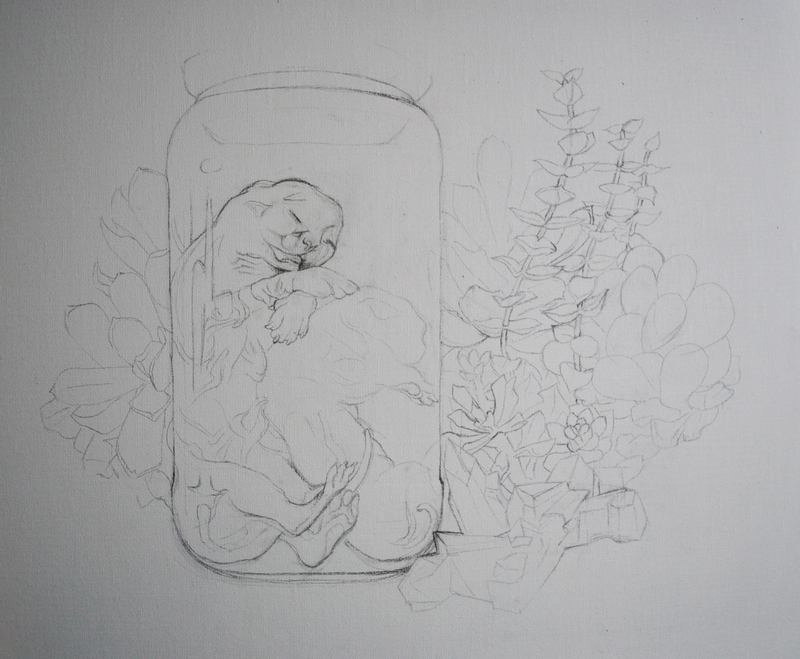 It’s important to have an understanding of the form as a whole before you start adding detail so that you can weigh up how it is working with the subjects around it but also because this is where your artistic license comes in. Even when painting realism the artist needs to ensure that the placement and flow of the composition is as visually pleasing as possible. You want to make sure that you understand exactly how a composition is working before you commit yourself to the detail. Finally I also want to quickly discuss something which I have used for the first time in this painting – Acrylic Medium. I have experimented with retarder but have never used it a great deal. Whilst you can use the medium to create similarly thin layers, you can also use it in several other ways. In this painting I used it in my mixes instead of water which gave me smooth fine paints to work with. It prolonged the drying time, although not to the same degree as retarder and so allowed for easier blending. An unexpected benefit was that you can also apply it directly to the canvas in order to create a sort of false blending with the colour underneath. I can see several other possible uses for medium and look forward to exploring it further. I would urge any acrylic artist to invest in some medium to have an experiment and look at whether it could enhance your techniques and preferred way of working. The kitten on the left and the plant far left, have both been filled with largely unblended colours. This is something I don’t usually do however, in the case of the kittens, I simply ran out of time when I was working and this photo has captured a technique I use but seldom acknowledge. I tend to work in this way when I start a new section that is complex. It helps to break down the subject into areas of dark and lights and helps me to start identifying the form of the subject. It was pleasing to see how well the light colours covered the graphite due to the layer of gesso I applied before painting. I aim to take a photograph at the end of each painting session however… here I missed several opportunities. This picture was a considerable number of painting hours after the last posted picture. As you can see, it’s really started to take shape now. It’s a shame I missed the photos inbetween as you’d be able to see the colour adjusts I made as I painted each one. I usually premix the main colours in my scheme and preserve them with a little acrylic retarder and seal them thoroughly to keep them fresh. I didn’t do this as I wanted to explore mixing from tube colours every time. I had hoped that it would add more colour tones and therefore interest to the fine detail and whilst I think it has achieved this, it was very slow going. 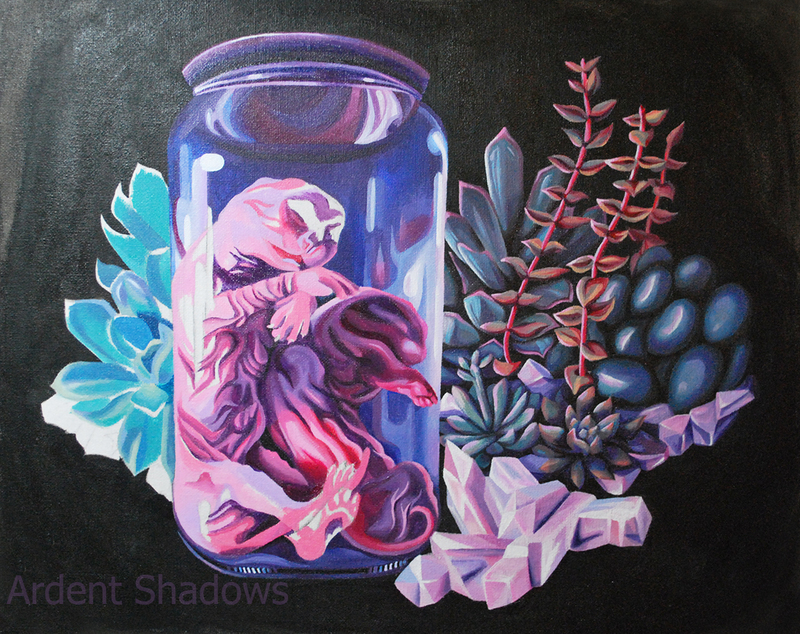 I found painting these succulents incredibly difficult! Although I’m equally pleased with the tall red ones as I used just a subtle shift in colours to bring one to the foreground. I think it was very successful. I have just finished what was the last painting of 2014 but I thought it fitting to save it for the first post of 2015. It has been an important piece for me and the start of a new approach to my work. It was an experimentation of media, a challenge to myself and the first purely still life painting I’ve done in a very long time. Whilst this was a chance for me to set up a real life composition to paint, I also wanted to create a perfect setting in which to display something which to me is beautiful and pure but something that many people will feel is a controversial. Please stay tuned for later posts where I will discuss the subject matter of this piece in more detail. First and foremost – I wanted to create a piece which showcased the beauty of life, all life, the beginning, the end, the oldest and most pure. Pure and raw nature. For now, what I want to discuss is the preparation I went through for this piece. I have not put pencil to canvas for many, many years. Mainly because it muddies the pale colours but also because I found that painting outlines directly onto the canvas was a more pleasurable way of working and allowed for greater freedom and expression. For this painting I have also used canvas board – another change for me. I carefully drew the composition accurately and precisely onto the board with a standard pencil and then sealed it with a clear gesso.This seals the graphite and maintains an adhesive surface for the acrylic paints. Whilst this attributes mainly to my reflective learning and so this is not something I think I will do – I can certainly recommend the technique for anyone wanting a precisely drawn design to paint over. To see a world in a grain of sand and heaven in a wild flower, hold infinity in the palms of your hand and eternity in an hour. William Blake.